Next on The Scoop: How to Feed Cats: Are We Doing It Wrong? November is Pet Diabetes Awareness Month, so get some tips on how you can keep your cat from getting feline diabetes. As the owner of a diabetic cat who, fortunately, has been in remission for a few years now, I get asked about feline diabetes quite a bit. One question a lot of people have is how they can keep their cats from getting the disease. The good news is that for the vast majority of cats, there are six simple steps you can take to prevent your furry friend from getting feline diabetes. 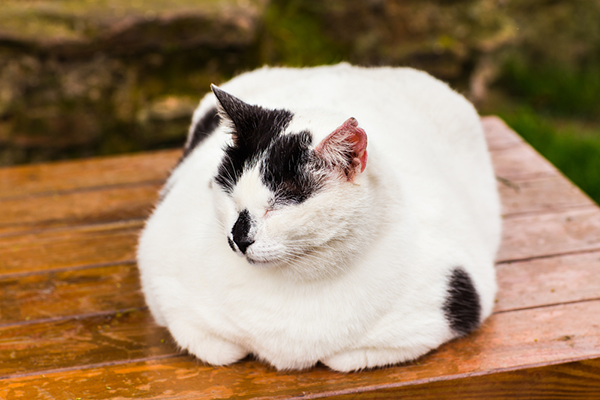 Fat cats may be cute or funny, but the consequences of obesity could mean feline diabetes. Photography by Tatiana Chekryzhova / Shutterstock. As with Type 2 diabetes in humans, the most common risk factor for development of the diabetes in cats is obesity. A recent study revealed that 58 percent of cats are overweight or obese, and that’s a lot of ticking diabetes time bombs. Fat cats may be cute, but the health risks certainly are not. Make sure you feed your cat according to the instructions on his food, and if you are going to feed treats and snacks, make sure you compensate by feeding less at mealtime. Cats are obligate carnivores. Their bodies evolved to eat a high-protein, low-carbohydrate and grain-free diet. 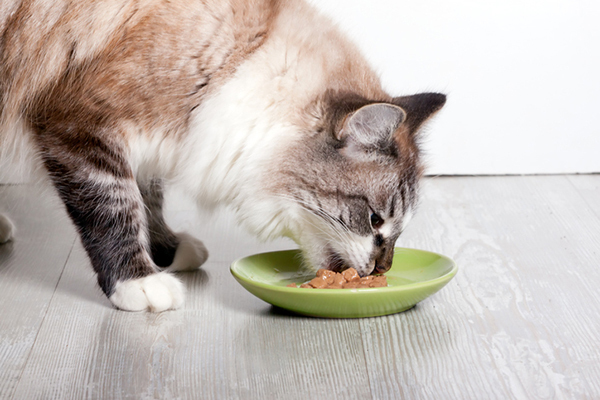 Most vets these days agree that cats do best on a diet of canned food because the protein-carbohydrate balance is more in alignment with what their systems are designed to handle. Talk to your vet to determine the right diet for your cat. 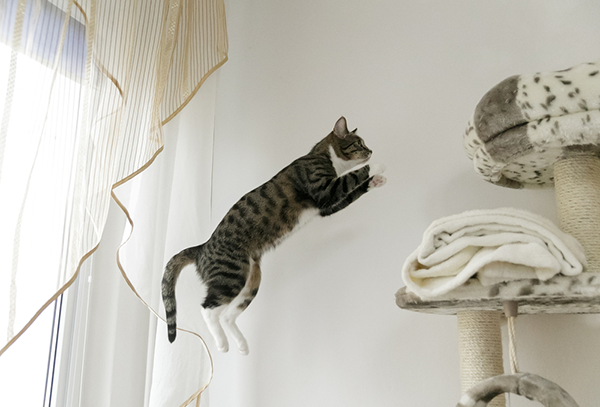 Environmental enrichment is key to keeping a cat fit and stress free — and can also prevent diseases like feline diabetes. Photography by Krzysztof Smejlis / Shutterstock. Not only will exercise keep your cat’s weight down, it will reduce his stress level as well, so be sure to play with him every day. A bonus of daily play is that it will strengthen the bond between you and your furry friend. Environmental enrichment such as “catification” projects or outdoor catios can go a long way to de-stress a cat and give him things to do and play with when you’re away from home. I know it’s less than a party to get your cat into a carrier and to the vet’s office, but that annual (or semiannual, if your cat is a senior) checkup can be a lifesaver. It can also help you figure out if your cat is gaining or losing weight, which can be important signs of potential problems. I’ve long believed that the money you spend on regular checkups saves you twice as much in the long run, because illnesses can be detected early enough to avoid invasive and costly treatment further down the road. Again, this is a core part of my belief in “an ounce of prevention.” Even if my Belladonna didn’t have a history of feline diabetes, I would still opt to have yearly blood and urine tests done to ensure that the parts of her I can’t see are working as well as the parts of her I can. Although some chronic illnesses such as allergies, asthma and inflammatory bowel disease are typically treated with steroids, these medications are known to decrease the effectiveness of insulin in your cat’s body. This doesn’t mean you should never use steroids, because they can and do save lives. However, especially if your cat is overweight, be sure to work closely with your vet and do regular monitoring of your kitty’s blood and urine to ensure his little pancreas keeps working well. Feline diabetes can be avoided if follow the steps above to keep your kitty fit, trim, and happy. Tell us: Do you have any other tips on how to prevent diabetes in cats? Share your thoughts — and maybe even your stories about how you got a diabetic cat into remission — in the comments. Thumbnail: Photography ©RooIvan | Thinkstock. Great write up, you may also want to know that there is an A1C test available now for cats and dogs. It is the “gold standard” test for physicians and it is now here for pets. In a single test you get the average glucose levels for the last 70 days in a cat and 110 days in a dog. My lean and species-appropriately fed cat had been diagnosed with ulcerative colitis. I was warned about the dosage of steroid is to be kept as low as possible, but he did eventually develop iatrogenic diabetes. Make sure you insist on blood and urine tests on a regular basis. I trusted the vet who kept telling me that my cat had allergy problems (probably because I don’t feed him the cat food with grain that they sell!) when I discussed his symptoms. Then it was too late. He is now on a much lower dose of steroid which keeps his colitis under control and it is doubtful he can be weaned off the insulin. I will get a second opinion on that score. My 18 yr old cat was diagnosed as diabetic in March. I noticed an increase in his water intake and urine output (well above his normal). I notice that you didn’t mention these key signs of feline diabetes so be alert to them. He was not overweight and has been an outdoor indoor cat his entire life so he was getting plenty of exercise. The vet believes the cause was more than likely due to his diet which was mostly hard food (a high quality hard food not grocery store level) although sometimes its genetic just like us humans. He has since been changed to a raw and low carb canned food diet and receives insulin shots twice a day. I would encourage any cat owner to change his or her diet away from free feeding hard food. Get them on raw and or low carb canned diet. Additionally when having yearly blood work or diagnostic blood work request a Fructosamine test which is much more accurate in diagnosing feline diabetes since the stress of a vet trip can drive immediate blood glucose levels high which could result in missed diagnosis.